Ammo info for Africa: What caliber for which animals? Which bullets? Best caliber rifle? Below you will find an interesting article written by an experienced African hunter, Terry Blauwkamp. Terry's first article for our website is another great read. Click here to read "African Safari Costs... what to keep in mind"
Terry has been to Africa 21 times and his wife Jo Ann is his favorite hunting partner. As an experienced hunter, reloader and gun-expert he surely has something to say about guns and ammo for a hunting trip to Africa! We thank him for the permission to place his article on our website. We hope that it will help you decide on able ammo for your Africa safari. "For those of you that are headed over to Africa on your next Safari this summer, or maybe a Spring Bear hunt, there are many things to consider. First of all is choosing a rifle. There are plenty of opinions on rifles and ammo, and that subject has already been badly beaten to death by every expert in the world. Just bring a rifle you can shoot very accurately and get on target quickly and get used to shooting it with a bi-pod and/or shooting sticks, leaning against a tree, or over a rock. My personal rifles of choice are the 300 Win Mag, 7 MM Rem Mag or 30-06 for plains game or Black Bear, and a 375 H&H or 416 Rem Mag for Buffalo. The 338 Win Mag is another great choice for plains game, and will work very well on Lion and Brown Bear as well. Once you're sure the rifle and load are zeroed in, forget the bench rest! Shoot free hand, sitting, kneeling or from improvised rests. One minute of angle accuracy is meaningless in the bush. Reloading your ammo for an African hunt is no different than reloading for any other hunt. You must follow all the proper procedures. What game you are going to hunt will certainly be the deciding factor on what gun and ammo you shoot. Do remember one very important thing about reloading for Africa and that is odds are you will be hunting in fairly warm weather. So do not load them too hot, or to the max. Most PHs have no problem with clients using reloaded ammo, but their number one complaint is that the ammo is "overloaded" or right to the max and this will cause the shell to be hard to eject after firing and will hinder any rapid follow-up shots. Using 1 or 2 gr. less powder will certainly make no difference to the animals you are shooting, but one or two gr of powder will make a big difference in chamber pressure and reliability of extraction. The next headache will be ammo that will not go into the gun. If this were to happen on a charging Buffalo or Brown Bear, you better hope your PH is a good shot! Be sure and cycle every round through your gun before you go and this goes for factory ammo as well as for reloads. If any round gives you any hint of being "sticky", set it aside and use it for zeroing or practice. What bullet to use for a given animal is a commonly asked question, and for gosh sake dont go to the local Sporting Goods Store and ask them. Odds are those employees havent got a clue what you are talking about, as most clerks dont know a Duiker from a Kudu, or a Brown Bear from a Black Bear. For Plains game or Black Bear, lets say in your 300 Mag or 30-06, I would use a minimum of a 180-gr bullet. Most of the time, I would also use a Premium bullet like a Trophy Bonded Bear Claw, Nosler AccuBond, or Swift A-Frame. The new Barnes TSX bullets are extremely effective, and are also available from Federal in some factory loadings. There has been much debate as to what constitutes a "Premium" bullet. Id rather than get into what I feel is not a Premium bullet. The old factory Winchester Power Points, Silvertips, as well as the Remington Core Lokts are not "premium" bullets. The will kill Deer size game just fine, but dont depend on them for deep penetration, and retaining their weight on large game. You do not need a Bonded Core super expensive bullet to kill plains game, but dont skimp on bullet cost. Ammo is the least expensive part of your trip so an extra few dollars will mean very little in the scheme of things, but poor bullet performance can cost you dearly in a lost trophy. An Eland is over 1,000 pounds and is the only one that really is like a Moose, so you really do need the penetration. A big Alaskan Brown Bear in a formidable opponent, and a 338 Win or 375 Mag is certainly in order using Bear Claws or TSX bullets. Zebra are by no means a small animal and can really take a pounding before going down, so use enough gun and a tough bullet on them too. Black Bear and all the rest of African plains game like Kudu, Wildebeest, Impala, Blesbok, and all the other "Bok-Boks", as we call them, are 200 to 600 pounds, and very thin skinned. Just put your first shot where it belongs, and any of the available bullets will do the job. If you are after Cape Buffalo, things take on an entirely different perspective. A Cape Buffalo is very big and VERY tough. This is why most countries in Africa give the 375 H&H as their minimum caliber allowed for hunting them. If you are going to use the 458 Winchester, use only factory ammo. You read it right: use no reloads in the 458 Winchester for hunting. Of all the calibers that are NOT user friendly, this one tops the list. Use your reloads for practice and then be sure and zero and hunt using factory ammo.The first thing I will hear is, "But the ammo is so expensive". My reply is simple: "If you can afford to hunt something that requires a 458 Win, and you cant afford the ammo, stay home". Federal Safari Premium and Speer Nitrex ammo is by far better than anything you can reload in the 458 Winchester. Case capacity is always a problem with the 458 Win so let the factory guys figure out what powder to use to get the proper velocity. Hornady now has a Heavy Magnum load for the 458 Win with their own 500 gr Solid bullet at an amazing 2260 fps, and that ought to really get any Buffalos attention. Hunting dangerous game is the opposite case from plains game, so spare no expense in the price of your ammo or quality of bullets. You mess this up and somebody is going to get hurt. Dangerous Game is the perfect place for the Barnes TSX, Trophy Bonded Bear Claws, Fail Safes, or Swift A-Frames. It is becoming increasingly acceptable to use an expanding bullet for the first shot on a Buffalo, followed by solids for pure penetration. The Trophy Bonded Sledge Hammers or Barnes new Banded Solids are just great. I am going to put Lion in to the same class as the Buffalo, except use only Premium expanding bullets on them. The 338 Win Mag on up is good medicine for them, and especially with a premium bullet. Now I am really going to "step on some toes". I am going to put the Leopard in the same class as plains game! By this I mean, you do not need a big 338 Win Mag or 375 H&H Mag for them. The bullets are too tough, and do not do enough damage internally. A Leopard usually is less than 200 pounds with light bones and thin skinned. Look at it this way: why would you shoot a Leopard with the same bullets you would shoot a Buffalo with? If you shoot him the same bullets you would shoot an Eland or Buffalo with, all you will do is punch a hole through him. Surely he will die, but not nearly as fast as if you hit him with your 30-06, 270 Win, 7mm Mag or 300 Mag. In these calibers, I recommend using expanding bullets like Hornady, Nosler AccuBonds, Remington Core Lokts or Winchester Power Points. The Nosler Partition would also be good, as they do expand very quickly and still hold the rear portion for penetration.Bullets 220gr Nosler Partition. The facts are that most all Leopards are shot from a blind at less than 75 yards. Precision bullet placement is the real key, and people shooting smaller rifles usually shoot them better than flinching with a big caliber. I would much sooner have a bullet from a 270 Winchester in the lungs of a cat than a gut shot with a 375 H&H. If you do not reload your ammo, that certainly is no disadvantage in todays world. Factory ammo today is the best it has ever been and I find it hard to reload better ammo on many occasions. In my experience Federal and Hornady produce the finest ammo out there. Federal has loads available with about every premium bullet you could ask for and Hornady uses their own bullets and are first rate too. There are lots of great bullets out there and you can hardly go wrong with any of them, but each is a slightly different in performance, so just choose the one that will best fit your needs." Feel free to contact Terry at this e-mail link or call him days at 616-896-6500 if you would like to chat about this a bit more. Picture above: Lion in the Kgalagadi Transfrontier Park - February 2008. The Kgalagadi is 220 km south of Uitspan Hunting Ranch. Terry Blauwkamp has been a member of SCI (Safari Club International) since 1984, and has been a contributor to Safari Times for 10 years. Thanks, Terry, for the great bullet pictures above! Interested in African trophy hunting? According to some people, the dazzling stripes on Zebras make it difficult for a predator to concentrate on a particular target and thus make it misjudge its pursuit and attack on Zebra. 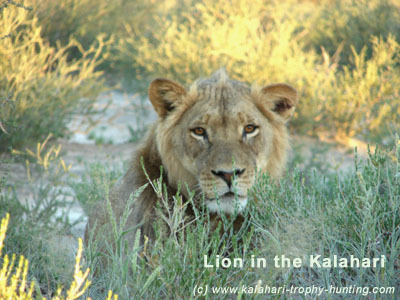 Read detailed info the Kalahari animals.